Joey Logano beat out Chevrolet’s Kevin Harvick and Dale Earnhardt Jr. to win the 2015 Daytona 500 under a green-white checkered flag. Logano, who started the race in fifth position, passed leader and Team Chevy driver Jimmie Johnson with only nine laps to go and held off intense pressure from his rivals for his first Daytona win. 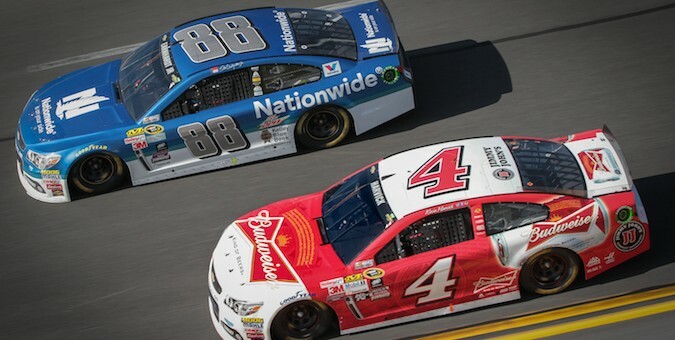 Harvick and Earnhardt were in good position to perform a draft pass on Logano in the closing laps, however a multi-car wreck brought out a caution flag, giving the Team Penske driver the win. “I thought we were in good shape with the 88 (Dale Earnhardt Jr.) behind us. I was trying to back up to him to get a run up off of Turn 4,” Harvick said post-race. Earnhardt and Harvick were understandably disappointed, but perhaps not as much as Gordon, who started from pole position in his last-ever Daytona 500. Gordon led a race-high 87 laps, but fell through the field late in the race and eventually got collected in the last-lap wreck, finishing 33rd. Gordon wasn’t the only Team Chevy driver whose race came to unfortunate end. Tony Stewart, who has never won the Daytona 500, drifted towards the outside in lap 41 and clipped the wall, forcing Matt Kenseth slow down, who was then hit by Michael Waltrip. Chevrolet looked poised to win the race at the halfway point, with Gordon, Kasey Kahne and Earnhardt sitting 1-2-3, but a series of cautions shuffled the field. Gordon and Earnhardt lost their positions, and on lap 146, Logano moved into first. More cautions would again shuffle the running order, but the Chevys would never recover. The field went three wide with 12 laps to go, and Johnson, Logano and Hamlin began to battle for the lead. A green-white checkered finish was sparked by an engine failure, forcing a restart with three-laps to go. From there, it was mostly easy sailing for Logano. Next story Community Question: What Do You Think Of Cadillac’s ‘Dare Greatly’ Ad Campaign?